A standard clause in every venture capital term sheet is about liquidation preferences. This blogpost explains how liquidation preferences work in practice, what forms of liquidation preferences exist, and what’s commonly used in the Dutch venture capital market place. Liquidation preferences give preferred shareholders the right to receive an amount of the proceeds from a sale or liquidation of the company before the common shareholders are entitled to receive anything. Sometimes entrepreneurs think a liquidation preference only applies in case of a bankruptcy or a wind down of the company, but this is not the case. It is usually tied to events (usually defined as ‘liquidity events’ or ‘liquidation events’) where the shareholders receive proceeds for their equity in a company, including mergers and acquisitions. As a result, the liquidation preference determines allocation of proceeds in both good and bad times. A liquidation event is usually defined along the lines of the following: a liquidation, legal merger, legal division, sale or redemption of shares or issuance of shares leading to the existing shareholders having less than 51 percent of the controlling rights in the Company, or the sale of all or nearly all of the business operations or assets of the Company. distributing the proceeds among all Shareholders in proportion to the nominal value of the Shares held by each Shareholder. In the event of a Liquidation, the holders of Preferred Shares will be entitled to receive in preference to the holders of Common Shares payment of an amount equal to their Total Investment [plus any accumulated and unpaid dividends]. Thereafter, any remaining proceeds will be distributed among all Shareholders in proportion to the nominal value of the Shares held by each Shareholder. Then there are multiples, dividends and caps. Under a multiple liquidation preference, the investor is paid out a pre-defined multiple of his invested amount before the remaining proceeds are distributed. Multiples may vary from 2 to 4 times the invested amount. Liquidation preferences are primarily meant to provide investors with protection against their downside risk, at the cost of the other shareholders. If the company is not lifting off and after years of struggling is sold at a very low valuation, liquidation preferences give the investors the right to get their money back first. In those circumstances, there is usually nothing or very little left to share among the common shareholders. Moreover, provided that the investors have a participating liquidation preference, they will, in addition to the aforementioned downside protection, obtain upside potential in the event of a successful sale or merger of the company. Let’s assume a company is sold for 5 million euro and the preferred shareholders invested 3 million euros, holding a 50 percent equity stake, with a 2x participating liquidation preference. It is clear that this results in proceeds flowing to the preferred shareholders. If the proceeds were 20 million euros, the investors would get 6 million plus 50 percent of the remaining proceeds, resulting in 13 million in total for the investors and 7 million for the founders. If the proceeds were 50 million, the investors would get 6 million plus 50 percent of 44 million, resulting in 28 million for the investors and 22 million for the founders. If it was a non-participating liquidation preference with a conversion right, at the 5 million euro sale, the proceeds would be shared 3 million for the investors, 2 million for the founders. At a 20 million euros sale, the preferred shareholders would convert and the proceeds would be shared 10 million each. At a 50 million euro sale, the proceeds would be shared 25 million each. To make this more visible, I’ve put these numbers in the simple graphs below (click to enlarge). As you can see, when the exit proceeds rise, the effects of participating liquidation preferences in comparison with non-participating liquidation preferences decrease. 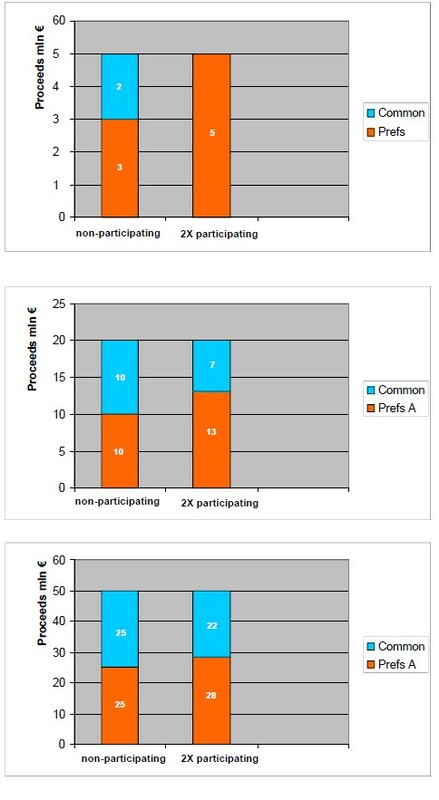 Which liquidation preferences are commonly used depends on market conditions and bargaining power of the parties, but generally speaking in Dutch seed or series A deals it is usually either a simple liquidation preference with a conversion right (or similar, see above) for the investor or a capped or non-capped 1x participating liquidation preference. Multiples like 2x or 3x participating liquidation preferences are not common at all. Finally, seed and early stage investors should be careful with asking for excessive liquidation preferences, since they may shoot themselves in the foot. Investors who invest in later rounds will require at least the same rights that the existing shareholders have. Moreover, later stage investors usually want their preferred shares to rank senior to the earlier investors: series C gets its preference first, then series B, etc. This might result in a situation where the holders of preferred shares issued in later rounds get everything and the seed investors, who started this ‘thing’, are last in line and get nothing. I fully agree that simple is the way to go, and we always strive to do so. There are circumstances, however, where a more agressive participating pref helps to bridge a valuation expectation gap. This for me is another part of the puzzle. A more realistic valuation often solves the need for participating preferreds. In lifescience investments they are also more prevalent n in tech.